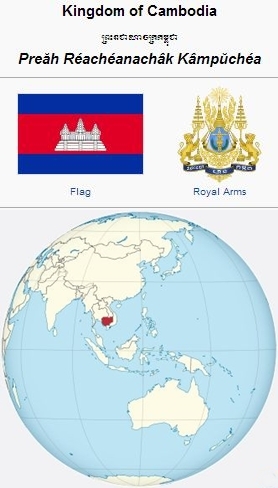 The Kingdom of Cambodia (Kampuchea) is located in the southern portion of the Indochina Peninsula in Southeast Asia. Its total landmass is 181,035 km2 (69,898 sq mi), bordered by Thailand to the northwest, Laos to the northeast, Vietnam to the east, and the Gulf of Thailand to the southwest. The estimated population of Cambodia in 2013 was 15,205,539. The Khmer Empire flourished for over 600 years from 802 AD until the 15th century, when Cambodia entered into alternating vasal relationships with the Siamese and Vietnamese. Cambodia became a protectorate of France in 1867. Independence was gained on 9 November 1953 and the country became a constitutional monarchy under King Norodom Sihanouk. The Vietnam War spread to Cambodia, during which the Khmer Rouge, the communist party of Cambodia led by Pol Pot, took control in 1975. The Cambodian Genocide of 1975-1979 saw the death of 1.5-3 million people. The Khmer Rouge were overthrown in 1979 by Vietnamese forces, resulting in continued conflict until the 1991 Paris Peace Accords. The vast majority of Cambodians, 90%, are of Khmer origin. Minority groups include Vietnamese (5%) and Chinese (1%). Theravada Buddhism is the official language of the country and is practiced by more than 95% of the population. Approximately 2% of the population is Muslim and 1% is Christian. Mennonite Central Committee (MCC) placed its first representatives in the capital city of Phnom Penh in 1981 and became involved in health, agriculture, education, technical assistance, and emergency aid. The two MCC representatives were primarily aid administrators, since the then Kampuchean government required that all assistance be negotiated with appropriate ministries of the central government. Assistance was concentrated in Svay Rieng and Prey Veng provinces. Short-term technical experts frequently lent their professional skills through MCC channels. Two Mennonite medical teams from India served in the MCC health program in Cambodia, 1984-1986. Wikipedia. "Cambodia." 12 May 2014. Web. 13 May 2014. https://en.wikipedia.org/wiki/Cambodia. Stauffer, Brenda. "Cambodia." Global Anabaptist Mennonite Encyclopedia Online. May 2014. Web. 26 Apr 2019. http://gameo.org/index.php?title=Cambodia&oldid=122102. Stauffer, Brenda. (May 2014). Cambodia. Global Anabaptist Mennonite Encyclopedia Online. Retrieved 26 April 2019, from http://gameo.org/index.php?title=Cambodia&oldid=122102. Adapted by permission of Herald Press, Harrisonburg, Virginia, from Mennonite Encyclopedia, Vol. 5, p. 475. All rights reserved. This page was last modified on 14 May 2014, at 06:21.